H. P. Lovecraft's The Shadow Over Innsmouth introduced us to a corrupt and fallen town, owned and controlled by the dark Esoteric Order of Dagon. But how did Innsmouth fall so far from the healthy New England town that it had been? What could possibly convince an entire port town to abandon their beliefs and morality for the darker path of the Necronomicon? The answer was found in the lost journals of Obed Marsh. This is the tale of how a man, devout in his Catholic beliefs, could be corrupted and torn from grace. This is the explanation of how he took all of Innsmouth with him. This is The Trials of Obed Marsh. Would you consider the audio edition of The Trials of Obed Marsh to be better than the print version? I've only listened to the audio version, which I thought was well told and effective. It was interesting to see Obed Marsh's journey from being a competent ship captain who cared about his community get twisted and manipulated into bringing the Order of Dagon back to his home town. Also, his horror at his son's love of the order, was nicely portrayed. What about Steven Gordon’s performance did you like? Overall, Steven Gordon gave a nice performance with a steady, Lovecraftian narration and good, differentiated voices for all the characters. The tag line for the movie version of this book would be "The Shadow falls over Innsmouth." 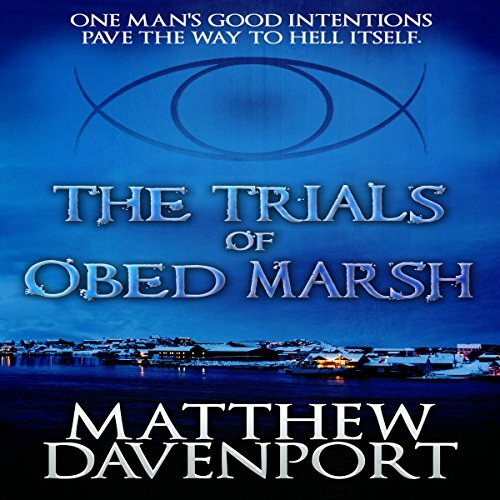 "The Trials of Obed Marsh" is a prequel of H.P. Lovecraft's "The Shadow over Innsmouth" that tells how Obed Marsh encountered the Order of Dagon and introduced it to Insmouth. Also, the story gives us details of the attack on Innsmouth that was blamed on a mysterious plague. Overall, it fit pretty neatly in this corner of the Cthulhu mythos, though it seemed Marsh's voyages to the Pacific were pretty easy for the 1830s. Also, it seemed a little strange that Innsmouth's dominant faith is described generically as "Protestant" and despite that, they hold mass at one point. For me, the most effective part of this story was seeing how Marsh and his family descended into madness. What would have made The Trials of Obed Marsh better? I think that the story was pretty interesting but then performance was seriously lacking. It didn't sound like a finished product. There were noises in the background and the volume fluctuated. The story itself. I have never read any of HP Lovecraft's works which are the basis for this book so it was an entirely new world for me. The book was on the darker side but it didn't really have much of a horror factor. It could have been a bit creepier. It didn't sound like it was a finished product. It needs some clean up done. Too many noises in the background and the volume fluctuated. Also the narrator spoke very slowly. It was as though he was reading and not performing. This book was given to me in exchange for an honest review. It is unbiased and my own opinion. Ship Capitan Obed Marsh is a known and loved political figure in his community. His crew brings home jewels and precious metals from a neighboring Polynesian island, making their town prosperous and wealthy. In exchange, the crew must allow the islanders to teach them about their god, Dagon. The crew agrees to learn but not participate, and Obed tells himself its a small price to pay for prosperity. And what the very Protestant townsfolk don't know wont hurt them, right? But of course, things get complicated, and the town falls into darkness. This is the story of how that happened. My favorite aspect of this story was the spiritual element- dream world creatures and rituals vs the Christian God and the soul. The question of God providing now vs. in the afterlife. My least favorite part about the book: not so great production quality. (Audio book) Several times I could hear noises in the background. The narrator was easy to listen to and had a good voice and he did a good job but the background noises were very distracting at times, especially towards the end of the story. Would I recommend this to a friend? Like with any other book, it depends on the friend and what genre they enjoy. I did enjoy it and I am curious about what else the author might have written. Overall, I give it 3 and a half stars. Verdict: This self-styled prequel to Lovecraft’s The Shadow over Innsmouth, in which Matthew Davenport details the events and happenings leading to the corruption of the town of Innsmouth, is a successfully executed tale of dread and horror. In the original Lovecraft story, Obed Marsh is described by the town drunk Zadok Allen as the person responsible for the town’s change. Although many details are alluded to by Zadok in the story as to what Obed Marsh did to bring corruption to Innsmouth, Obed’s story remains largely untold. It is only revealed that Captain Marsh began trading basic goods with an unnamed island in the South Pacific in exchange for strange gold relics, and befriended the island’s chief Walakea. Eventually he imported the islanders’ strange religion to Innsmouth and initiated a series of events that converted the town from Protestantism to the worship of Dagon. Davenport does an outstanding job of not only showing us the events leading to the initial corruption of Innsmouth, but using the Lovecraftian method of slowly building up to a terrible conclusion. Let’s start with the problems that the story has before moving on to what makes it a modern day Lovecraftian classic. The most glaring of all the issues are the anachronisms that crop up. While the prose is mostly written in a serviceable pseudo-19th century style that more than suffices as a nod to both Lovecraft and the era in which the story takes place, there are a couple dozen instances where a jarring anachronism pulls one from the story. It would be a disservice to the author list them all here, but words and phrases origining in the early and mid-twentieth century show up where they are plainly not welcome. The second problem with this story is the timeframe that Davenport adopts when describing Captain Marsh’s transit to and from the South Pacific island featured. There were multiple places where it was metioned that this trip takes a week or two, when in fact a sail-powered ship from the early 19th century would have required months each way. Even ships of today could not make it from New England around South America and to a South Pacific island in a week. A third issue is that the story reaches a crescendo of horror, but then a somewhat indulgent epilogue is added as backstory to Davenport’s backstory. The epilogue is somewhat chilling and clever, but it can’t beat the previous act, which I couldn’t help but think would have been where Lovecraft himself would have ended the tale. But these are minor issues. The beating heart of this story is the fact that it never stops moving forward, and it never stops building the dread of something horrible. Even for fans of Lovecraft who have read Innsmouth (read: all of us), and who know the outcome of the town and thereby the outcome of Davenport’s story, there is still a dreadful surprise at the end, something as sickening as it is subtle. With regards to the reading of this book by Steven Gordon, my personal experience with most Lovecraft and Lovecraftian works is that they are read by dark and brooding voices. That is not the case here. Gordon doesn’t miss a beat, and has decent vocal variation for the characters Obed and Walakea, but his voice does not carry the darkness which is baked into the narrative itself. Despite the glaring anachronisms and the impossibly fast sailing vessels, this story deserves 5 stars for its pace, inventiveness, style and most of all restraint. It holds back the entire time, feeding the reader just enough to keep listening (or reading) intently, and for those who are paying attention, the gut-wrenching denouement to Obed’s trials will never be forgotten. Not necessarily. I tend to prefer to read books more than I listen, so it's just a preference thing for me. What other book might you compare The Trials of Obed Marsh to and why? Technically it was a movie first but Revenge of the Sith. Just in that it was about a character in duel religious environments, both the antithesis of one another and yet either one he holds no real conviction to. His only loyalty is to family, community and legacy. In the end he winds up doing all manner of evil for "good" means. What aspect of Steven Gordon’s performance would you have changed? He was a solid narrator but I felt there was no inflection to his reading. By that I mean that in terms of emotions he didn't deliver the lines as if he was happy or sad or scared, whatever the story called for, but that really wasn't a bad thing, more so something that I just noticed. Who was the most memorable character of The Trials of Obed Marsh and why? The native Walakea was the most memorable to me aside from the main protagonist of Obed Marsh. I liked him because you really believed his religious devotion to his god Dagon. While horrific, you could see parallels to anyone's belief system and that made it all the more interesting to think on and be scared of at the same time. Really enjoyed the book and would recommend it highly. He's an exceptional narrator, and I loved the pacing and shifts in his voice when conveying different characters. Obed Marsh, Innsmouth’s sinister patriarch and the town’s first acolyte of Dagon, has been a figure of menace, hovering in the background of the town since HP Lovecraft first introduced him through the drunken, rambling monologue of Zadok Allen in The Shadow over Innsmouth. Here, Davenport attempts to bring the misty figure of Obed into focus, and provides his own interesting interpretation of the years leading up to the seaside town’s transition. A tricky task, and he also attempts to rehabilitate Marsh, as much as is possible. He does so by consistently stressing Obed’s devotion to his family and his town, and his hopes for the future. As the old saying goes: the road to hell is paved with good intentions. Or Y'ha-nthlei in this case. To accept this version of events, the reader must assume that Zadok Allen’s account was incomplete. Understandable, given his age at the time and his limited exposure and understanding. However, the story has three flaws. The first being a lack of young Zadok himself. Perhaps I missed it and must listen again, but I had hoped for a brief appearance of the boy as a witness to the horrific climax he would later relate. From a glance at other reviews, there also seems to have been a mistake about the town’s religious affiliation. Davenport had originally written it as a Catholic town. Apparently he later tried to fix this, because the audio I listened to specified Protestant, but the references to religion still had a Catholic feel, and he did not specify the multiple Protestant denominations that would be in existence. -Obed’s realization that his son has been made a true convert to Dagon. The shift to actually sacrificing travelers was not touched on with enough horror either, I thought. Nonetheless, the story remains effective in other ways, as Davenport shows the little compromises made in the name of necessity that sweep a good man into the depths with the inevitability of an undertow. He also references other aspects of the Lovecraft cosmos, such as the Dream Lands, and employs them in a subtle and truly terrifying turn of events at the end. This short story captured the mood and tone of Lovecraft. Really enjoyed the back story of Innsmouth as it fit in perfectly with the existing mythos. The ending was masterfully done and I have to give Davenport credit for allowing the reader to experience it on their own terms (I'll leave it at that so not to give away anything). "When you sup with the devil...."
This ingenious story fleshes out the narrative hinted at in HP Lovecraft's classic The Shadow Over Innsmouth, and explains how a small New England fishing village came to be associated with hybrid horrors from the deeps. If you could take any character from The Trials of Obed Marsh out to dinner, who would it be and why? Dinner with the Deep Ones would certainly be a very exciting experience, but you'd only go through it once!